Welcome to “HCH Painted Figures website". We supply high quality wargame/collector figures that are ready to play with. All you have to do is unpack them, fix the weapons and base them and you have a ready made army ! For those of you who do not have the time, skill or inclination to paint your own, this is a perfect choice. After browsing the site and seeing what we have to offer, we hope you will join the ranks of our many customers who are the proud owners of some of our figures.Wether you want one figure, a unit, or a full army or maybe a present for the wargamer in your family, we hope you will find what you are looking for from the ranges displayed on our website. Please let us know if you have any problems accessing or using the website, we value your feedback. SHIPS - Generic Ancient Trireme type ship, suitable to represent Persian or Phoenician fleets for the period approx 450BC - 150BC. Currently reduced to £29.95 a saving of £20.00 each. Listed under Ships on the main Menu for full details and photographs. 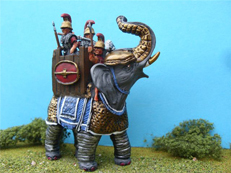 ARMOURED ELEPHANTS - Suitable for the Wars of the Successors.There are two different elephants and four different crew types to choose from. Currently reduced to £22.00 a set a saving of £6.00. Listed under Ancients Section, Successors for details and photographs.